University of Illinois chemistry professor Paul Hergenrother, right, and veterinary clinical medicine professor Timothy Fan tested an anti-cancer compound in pet dogs that is now being used in human clinical trials. CHAMPAIGN, Ill. — Clinical trials of the anti-cancer agent PAC-1 are continuing to expand, thanks to a $7 million angel investment from an anonymous contributor who originally invested $4 million to help get the compound this far in the drug-approval pipeline. The U.S. Food and Drug Administration also granted PAC-1 orphan drug status for the treatment of glioblastoma multiforme, a deadly brain cancer. This designation is meant to encourage development of drugs to treat rare diseases or conditions affecting a small subset of the population. Some steps in the approval process are aided or expedited for orphan drugs. An estimated 12,120 new cases of glioblastoma are expected in the U.S. in 2016. The median survival with standard-of-care therapy is 14.6 months. PAC-1 targets an enzyme, procaspase-3, which is elevated in cancer cells. When activated, this enzyme spurs cell death. The drug first showed promise in the treatment of pet dogs with spontaneously occurring cancers. A Phase I clinical trial of PAC-1 in human cancer patients began in 2015 and has so far involved about a dozen patients with a variety of late-stage cancers. The human trial is being conducted at the University of Illinois Cancer Center in Chicago and at the Sidney Kimmel Cancer Center at Johns Hopkins University. 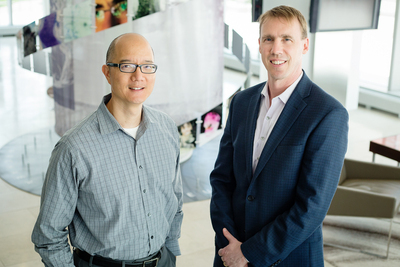 A Champaign-based company, Vanquish Oncology, is the regulatory sponsor for the research. Phase I trials are meant to determine the maximum tolerable dose of a cancer agent and are not tests of a drug’s efficacy, said University of Illinois chemistry professor Paul Hergenrother, who discovered PAC-1’s anti-cancer properties more than a decade ago. He worked with U. of I. veterinary clinical medicine professor Dr. Timothy Fan to first test the drug in pet dogs with cancer. Some of the preclinical studies – in cells, mice, rats and dogs – suggested that PAC-1 could aid in the treatment of glioblastoma, a disease for which there are few therapeutic options. “We know that PAC-1 can be safely combined with curative intent radiation therapy and oral temozolomide in dogs with primarily glioma, or brain tumors,” said Fan, who has worked closely with veterinary neurologist Dr. Michael Podell and veterinary radiation oncologist Dr. Jayme Looper of the Chicago-based MedVet Medical and Cancer Centers for Pets to conduct clinical trials of the drug in pet dogs. “Surgical resection, radiation and temozolomide is the standard treatment regimen for glioblastoma,” Hergenrother said. A second component of the Phase I trial will test PAC-1 in combination with temozolomide in human glioblastoma patients whose tumors have returned after standard treatment, he said. To reach Timothy Fan, call 217-333-5375; email t-fan@illinois.edu.